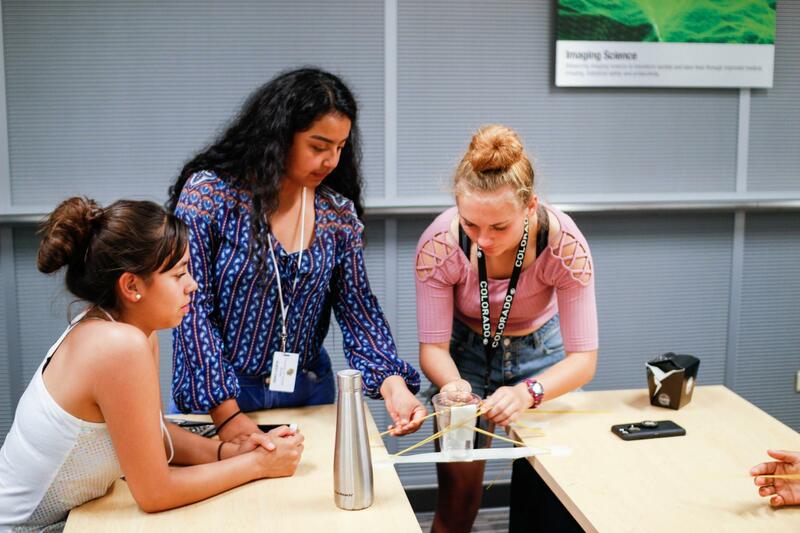 A group of 100 rising high school juniors from the Roaring Fork Pre-Collegiate Program were able to bridge what they knew about engineering to real experiences and answers at The BOLD Center last week. CU Boulder started the Pre-Collegiate Development Program for first generation middle and high school students in order to provide leadership and higher education resources. Their time spent at the College of Engineering was split between an engineering challenge workshop led by current students, and a presentation given by Kenneth Smith, director of partnerships. Current GoldShirt Scholars, Jasmine Gamboa (EnvEngr‘20) and Jennifer Murillo (MechEngr‘22), BOLD Scholar, Norte Morales (ArchEngr‘21), ASPIRE Scholar, Asmita Dhakal (CompSci‘20), and Engineering Ambassador, Sydney Joffrey (ChemEngr, EnvEngr‘19), led the bridge building challenge with the Roaring Fork students. For the challenge portion of the day, teams were given 20 minutes to design and build a one-foot long bridge that could support increasing weight. Each group was given 25 sticks of dry spaghetti, a few feet of tape and a plastic cup which together weighed about 30 grams. The winning team’s bridge held over 20 times its own weight in beads, cell phones and wallets and would have held more had the team been able to balance more items. There were many different designs, but the most successful ones were created by students who pulled inspiration from bridge structures they have seen in their own lives. Engineers commonly look to and learn from existing designs around the world in order to create their own innovations, which is exactly what these students were able to do. These mentoring and teaching opportunities connect CU Engineers with prospective students and allow them to share their engineering knowledge while developing key leadership skills. At the same time, visiting students experience the unique and welcoming BOLD Center community which supports diversity and leadership in engineering, computer science and other STEM fields. Jasmine Gamboa is a CU Boulder Engineering student studying environmental engineering. Maria Kuntz is the assistant director of communications, inclusion and community in the College of Engineering and Applied Science.